We offer wide range of Ultrasonic Cleaners For Medical Fields. These ultrasonic cleaners are meant for the medical sector and perform really well for desired applications. Ultrasonic Cleaners for Medical Fields is widely used in the medical fields and comprises of an efficient ultrasonic tank. In this tank cleaning media is heated up to 55 to 60C. The function of this tank is to remove the contamination by means of vigorous ultrasonic cavitation. 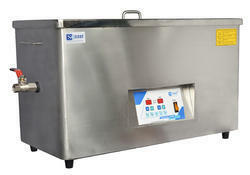 The continuous filtration with oil skimmer ensured contaminant free cleaning bath. Looking for Ultrasonic Cleaners For Medical Fields ?